The Zen amp and preamp I've built are the creation of Nelson Pass. Reprints of the original published article can be found on the Pass Laboratories DIY web site. Refer to those articles for the theory of operation, electrical details and construction hints. On this page, I am only going to provide some thoughts and observations from my experience in building these wonderful projects. This is my Zen preamp. It is packaged in an old X-terminal chassis. The two rotary knobs on the front panel are the volume control and a three input selector switch. The knobs are brushed aluminum. On the far left of the front panel is a green neon power lamp. The power switch is on the right side, towards the rear of the unit. A standard IEC power connection is used. Not shown is the rear of the chassis which contains RCA jacks for three pairs of inputs and one pair of outputs. My only alteration to the original design is the addition of the input selector switch. As for the actual construction, my only advice is to splurge on the volume control potentiometer. My original pot was a cheap one and I got what I paid for. I ended up with a quality unit from The Parts Connection / Sonic Frontiers (they no longer carry DIY parts). I had hoped to package the Zen amplifier in a similar chassis, but that proved impossible for several reasons - such as the size of the transformer, capacitors and heat sink. 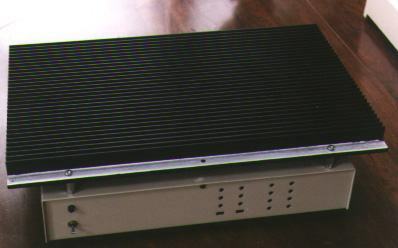 My final chassis consists of an old Cabletron network box of some sort, with a massive heat sink mounted above the cover seperated by four 3/4 inch spacers. The output devices (MOSFETs) are mounted on the underside of the heatsink. 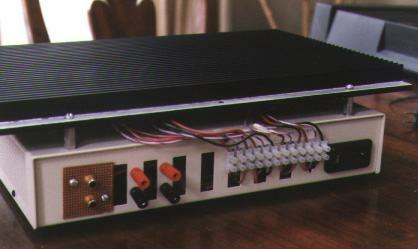 This is the Zen amp viewed from the front. On the left is a toggle power switch above a green neon power lamp. The four vertical rows of LEDs just right of center are currently unused (could turn it into some sort of level meter). The view from the back shows the RCA input jacks on the left, followed by the output speaker binding posts. An IEC power connector is on the far right. The row of white connectors - 12 pairs in all - connects leads from the MOSFETs underneath the heatsink to the PCB inside the box. While not ideal, this setup allowed me to assemble the pieces seperately and finally connect them electrically. 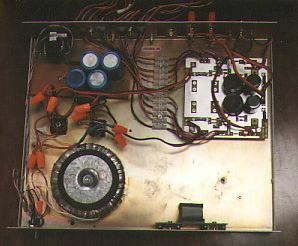 The inside of the chassis shows the toroidal transformer, power supply capacitors towards the upper left and PCB on the upper right. The empty space on the lower right is reserved for whatever will eventually drive the front panel LEDs. The transformer used is a surplus unit from MECI. It is rated at 2 X 24 VAC at 4 amps each. The circuit built uses the PCB from Old Colony Sound Labs which is the original Zen design without modifications presented in The Return of Zen. The most troublesome part of this project was finding an adequate heatsink. The two MOSFETS in each channel dissipate about 70 watts of heat. Since I did not want to deal with fan noise, I needed sufficient heat sinking for 140 watts. The heat sink I used is from a surplus store and weighs a LOT ! At idle, the center of the heatsink reached 127.2 degrees Farenheit in a room with an ambient temperature of 65 F. It took just under 45 minutes to reach equilibrium. Note that the heatsink is not mounted optimally - convection is much better if its lengthwise fins were mounted vertically. My arrangement is a compromise of available chassis and heatsink. The sound of the Zen amp and preamp are superb. In the spirit of the Zen designs, the less said the better. A funny thing happened recently. I had the Zen preamp hooked up to my computer and noticed that some of my waveforms were clipped on the negative half of the waveform. This didn't happen all the time, only in some obscure cases. After some analysis, I determined that at higher input voltages, both channels would clip as I had seen. The fix was pretty simple. With a 1.4 V RMS input (2 V Peak to Peak, the most I plan to deliver to this preamp) I adjusted trimmers P102/P202 until the output no longer clipped. This turned out to be a little more then 7 V at the gate of Q101/Q201. I eventually set the trimmers to deliver 6.92 V. This value used to be 8 V in the original design. The output will now swing unclipped at just under +/-10V with the full 1.4 V RMS input. I suspect this will increase distortion but I haven't done any distortion measurements yet.